Picture a town nestled amongst forested peaks, with dusty trails leading to icy waterfalls and panoramic viewpoints. Welcome to Minca, our favourite place in Colombia. 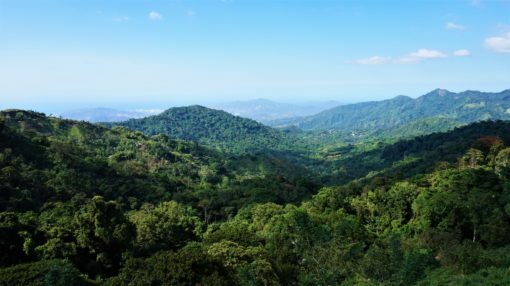 This tiny oasis in the Sierra Nevada mountain range is a haven for trekkers and nature lovers, full of diverse wildlife such as hummingbirds and toucans. 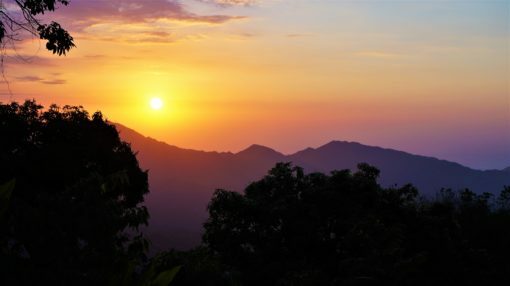 From touring coffee and cacao farms to bathing in waterfalls, here are our top things to do in Minca, how to get there and where to stay. 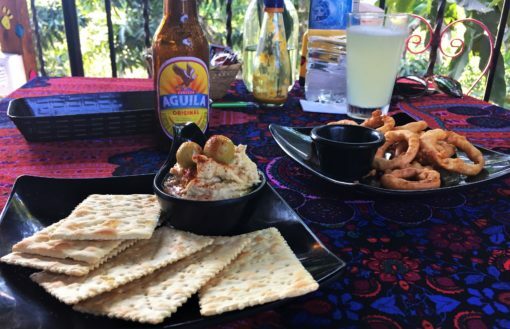 Heading to Cartagena in Colombia? Read our travel guide for Cartagena here. 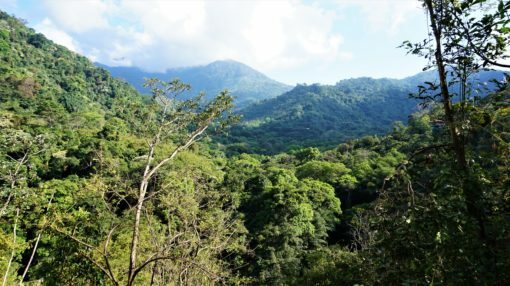 Minca lies just 15 kilometres from the sprawling coastal city of Santa Marta in the north of Colombia. You can book cheap domestic flights to Santa Marta from most Colombian cities, including Medellin and Bogota. 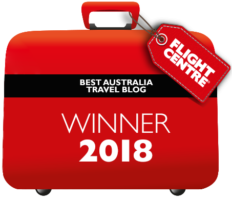 Popular airlines include Avianca and Viva Colombia, who we flew from Santa Marta to Medellin with for £95. You can also travel by road, we took a Berlinas bus from Cartagena to Santa Marta which cost $40,000COP (£10) each and took four hours. Once you’re in Santa Marta, you can head to the central bus station (on Carrera 9, between Calle 11 and 12, near the public market). Buses, known as ‘colectivos’, leave when they’re full and the journey cost us $8,000COP (£2) each. Getting to Minca from Santa Marta is pretty quick, it takes just 45 minutes up twisty mountain roads. You can buy return tickets back to Santa Marta from the station in Minca, where you’ll be dropped off, on the day you leave. Minca consists of just three main roads lined with shops, restaurants and hostels surrounded by towering mountains. It’s a nice place to hang out, but most people use the town as a base to explore the surrounding area. 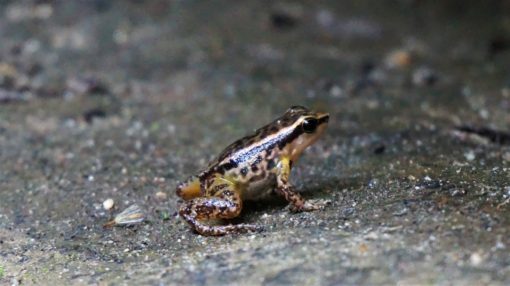 Here are some of our top things to do in Minca, all these places are walkable from town. 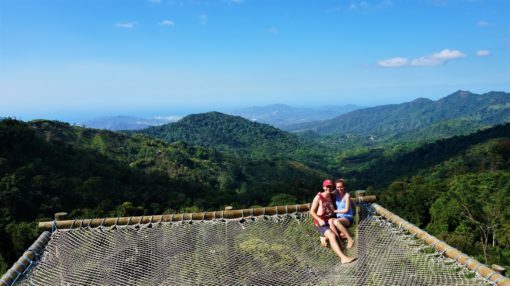 We loved hiking in Colombia but you can hire a moto-taxi if you prefer. 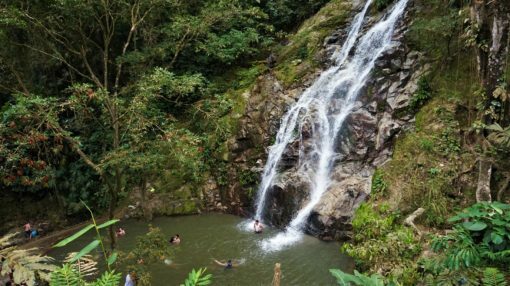 Pozo Azul – this waterfall and swimming hole is about an hour’s walk from Minca. 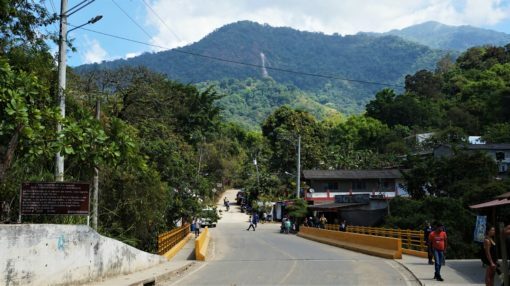 Coming from Santa Marta, cross the bridge and follow the road straight ahead for a good 40 minutes, then you should see signs for Pozo Azul on the left immediately before a café . Go early or late afternoon to avoid the crowds and intense heat and don’t forget your bug spray. The water here is fairly shallow and safe to bathe in, though icy cold. On the way back we spotted a beautiful peacock, keep your eyes peeled for wildlife as you trek. 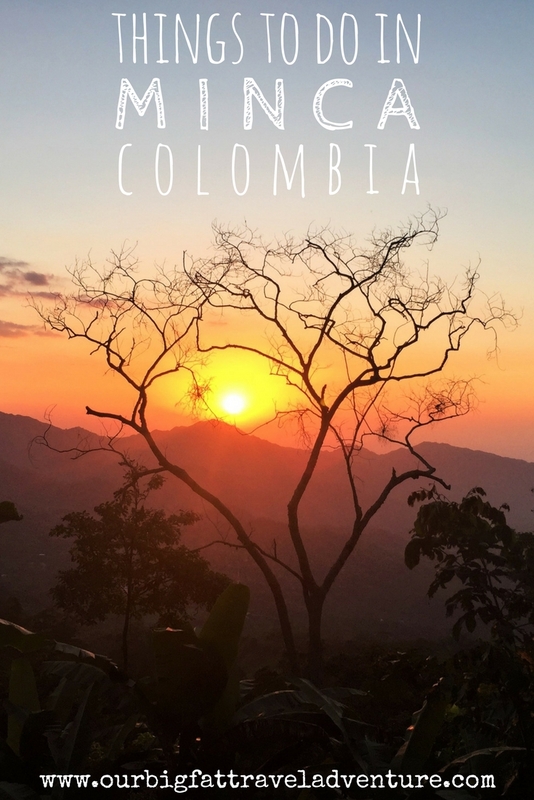 Finca La Candelaria – our visit to this family-owned coffee and cacao farm was the highlight of our trip to Minca, you can read more about why we loved it in this post. It takes about 50 minutes to hike up from town. 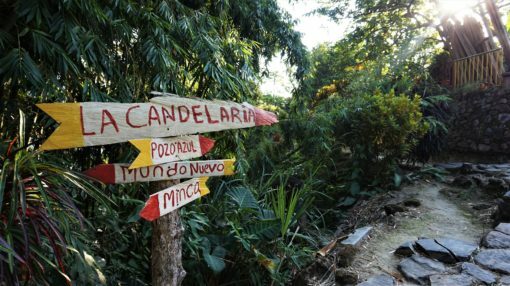 Take the road on the left before the bridge and follow the signs for La Candelaria, after about 40 minutes, you’ll be directed off the road and have to walk among some of the coffee and cacao plants. You’ll be greeted with a cold lemon juice and samples of coffee and cacao tea, which you can enjoy whilst taking in the incredible views. 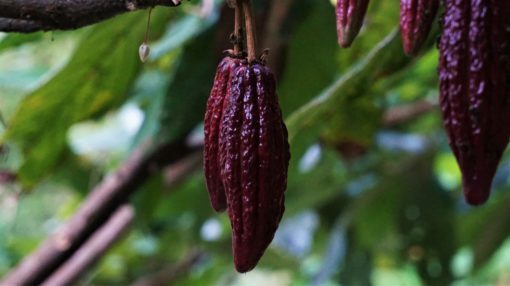 We opted for the cacao tour, which lasted about an hour and cost $20,000COP (£5) each. 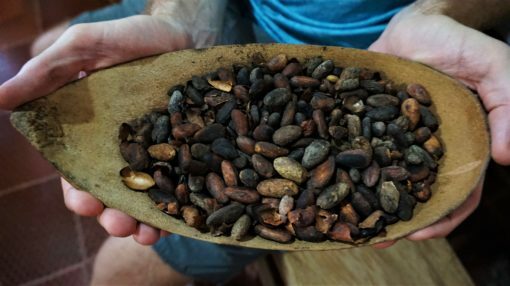 It was great value for money as we learnt all about the production process, from pod to bean and finished product, and got to taste cacao nibs, hot chocolate and 100 percent cacao. 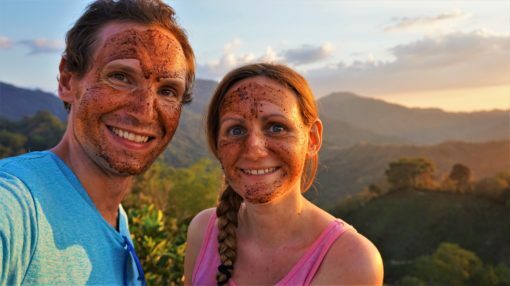 We even tried a coffee and cacao face mask and bought a bag of raw cacao to take away with us for $15,000COP (£3.75). Cascada Marinka – it took us nearly an hour to hike here from town. After the bridge, take the road on the right and walk past the church and playground, follow this road until you reach a large boulder with signs for the waterfall on your left with a café on the corner, continue up that road for about 10 to 15 minutes. The path up to the nature reserve is extremely steep but worth the climb. 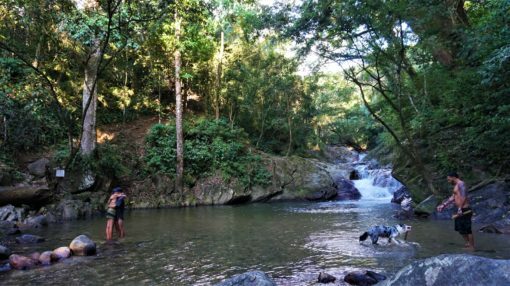 There are several platforms where you can sit and have a picnic and the main bathing pool is perfect for a refreshing dunk after your sweaty climb. Casa Elemento Minca – from Cascada Marinka, you can follow the road upwards to Casa Elemento, the most famous hostel in Minca. Be aware that it’s a very steep one-hour climb from the waterfall and I’d recommend wearing sturdy footwear. When you finally arrive, you’ll be greeted with stunning views over the Sierra Nevada and huge hammocks suspended over the trees. Casa Elemento is a popular place to stay in Minca, you can see prices and book here. We’d read that it had changed ownership and recent reviews weren’t great, so we chose not to stay the night. Instead, we paid $10,000COP (£2.50) each to visit, which included a drink. We also had the option of using the small pool and relaxing in the hammocks before trekking back down to Minca. 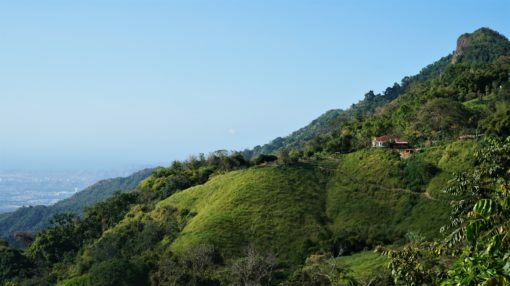 La Victoria – since we visited Finca La Candelaria, we decided to give this coffee farm a miss, but we heard from some other travellers that they had a great tour there. La Victoria Bistro also has brilliant ratings on Tripadvisor, so you could hike up there (it takes about 90 minutes from Minca), have lunch and take a tour of the coffee farm. Coming from Santa Marta, cross the bridge and follow the road straight ahead until you see the signs. Mirador 360 – this was the highest point we trekked to, standing 1,200 metres above sea level. From Minca town take the road before the bridge, follow the road past Mundo Nuevo and Finca La Alicia and follow the small turquoise signs. We trekked here while staying at Mundo Nuevo and it took us about 45 minutes, the final section is through steep, overgrown terrain. 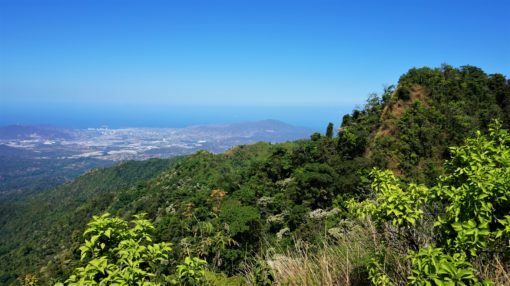 We had the view to ourselves though and could see across the Sierra Nevada mountains and down to Santa Marta and the sea beyond. There are many hostels in Minca town which offer both dorm and private rooms. Prices range from £10 for a dorm room to £17 and up for privates. 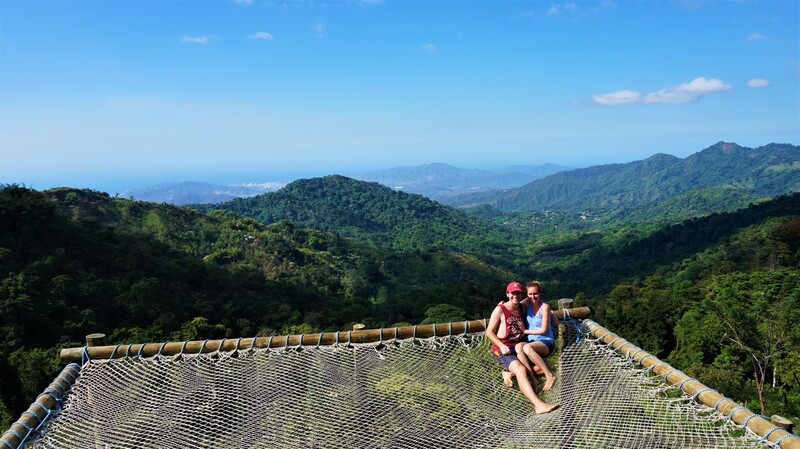 We stayed at Coco Bomgo, a new Colombian-run hostel. The owner was absolutely lovely, looking after us when I was sick. The whole place was spotlessly clean with soft beds and a kitchen for guests. We paid $90,000COP (£22.50) for a room at Coco Bomgo with private bathroom and would highly recommend it, you can book this Minca hostel here. 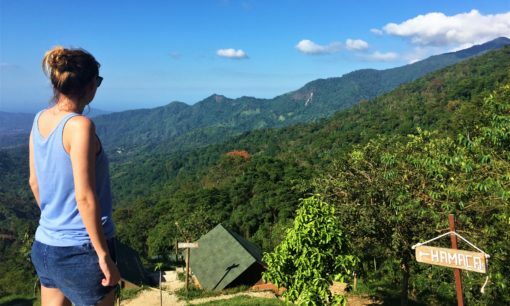 We spent the second half of our stay further up in the mountains at an eco-resort, Mundo Nuevo, which was super-peaceful and quiet with stunning sunset views. We paid $142,000COP (£35.50) per night for a double room with private, open-air bathroom and breakfast, but dorm beds and hammocks cost $40,000COP (£10). You can book a stay at Mundo Nuevo here. Although we loved being surrounded by nature, we did find the beds hard and felt a bit trapped as it’s a 90-minute round trip to walk down into Minca. The food at Mundo Nuevo is vegetarian and communally cooked, so you don’t get to choose what you eat. Since we were recovering from food poisoning, this wasn’t the best option for us. The Lazy Cat – this is Minca’s top-rated restaurant online. To get there, take the road immediately on the right immediately after the bridge, The Lazy Cat will be on the right about 50 metres along the road. Although we ate there two days in a row and were very happy with our meals, on the third occasion we got food poisoning. We weren’t alone either, another couple we met also got sick there the same night and heard that several other people did too. So, bear this in mind if you do try The Lazy Cat. The meals we did have there cost about $10-20,000COP (£2.50 – £5). Duni – take the road on the right immediately after the bridge and then take the next road on the left, Duni is about 20 metres up. Sadly, we didn’t get to try this place as it was closed on the day we visited, but it looks great and serves vegetarian and vegan food. Restaurante Santisabella – take the road on the left before the bridge and then take a left opposite Coco Bomgo, the restaurant is about 20 metres up the road. We heard that the pizza here is delicious, but they didn’t have it the day we visited. They did serve us some nice veggie fajitas and chips though, which was about all we could handle after recovering from food poisoning. There are also several mini-marts in Minca where you can buy snacks and drinks. You can refill you water bottles in some shops to save on plastic waste too. Have any questions about things to do in Minca? Ask away in the comments below. Thanks Louisa, yes, we are loving it! I’m looking to go this summer, how long do you suggest we stay in Minca for? 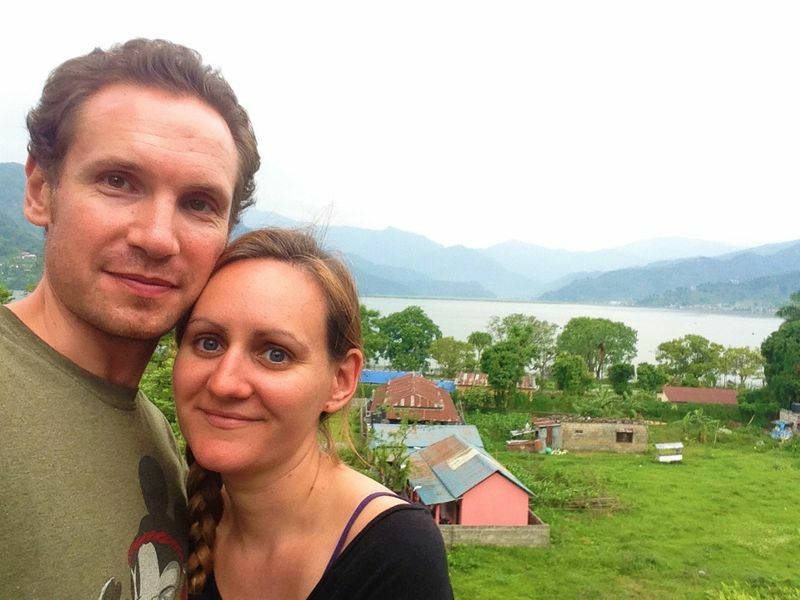 Hi Bianca, we were in Minca for a week (a few nights in town and the rest up in Mundo Nuevo). You can probably see the main sights in three days, but we wanted to take some extra time to relax, plus, we got food poisoning while we were there and needed to recover. Have a great trip!